At Impact Trophies & Medals, we offer a huge range or embossed medals suited to your chess tournament, club or competition. Our varied range includes gold silver and bronze medals available in a range of sizes, chess board medals and chess piece embossed medals. 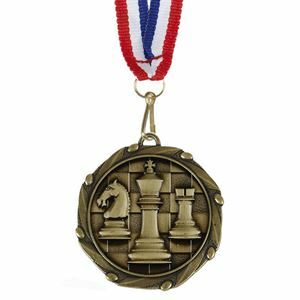 Impact Trophies & Medals are a leading retailer of embossed medals for chess. Great for personalisation, many of our embossed medals can be personalised with printed text labels for the back of the medals as well as a wide range of clip on medal ribbons for displaying your medals. The cost effective Combo Chess Medal & Ribbon, is supplied with a FREE red, white and blue ribbon. The metal medal features an embossed image of three chess pieces; a king, a knight and a rook on a chessboard background. This glossy metal medal features an embossed chessboard with a king and knight in the foreground and a pawn and rourke in the background. The textured banner has the wording CHESS. The Mini Star Chess Medal is die-cut around the detail of the chess pieces, star and banner. Embossed on a backdrop of a chessboard, are three chess pieces: a king, a knight and a pawn. 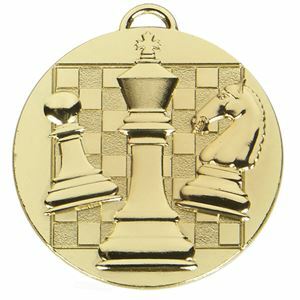 The Target Chess Medal is metal and glazed with a shiny golden, silver or bronze coating. Featuring a detailed embossed image of a chess board and a large knight piece, this medal would make a super award for any chess tournament. Cast from a premium grade of brass, the weighty medal comes in three colour finishes; gold, silver and bronze, and belongs to our bulk purchase range of medals. 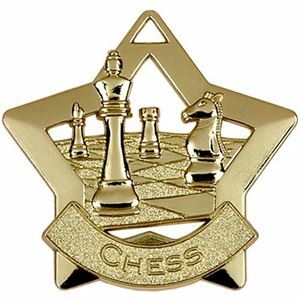 Supplied in quantities of 100 or more, this Chess Brass Medal offers outstanding value for money. 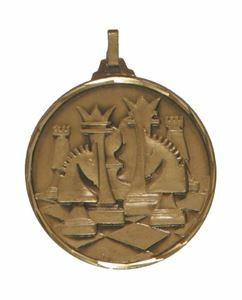 This large attractive Cone Frame Chess Medal is part of our bulk purchase range and is offered in quantities of 25 and above. Representing excellent value for money, the medal is cast from a superior grade of metal and coated in a choice of 3 burnished colours; gold, silver or bronze. The die cast medal features three modern style chess pieces at the centre of a hollow triangular frame and would be ideal for any chess tournament. 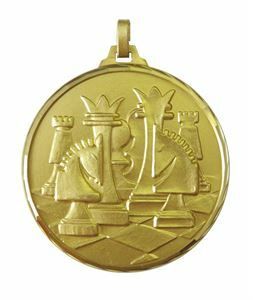 The High Relief Chess Medal is a high quality heavyweight bronze metal medal available in gold, silver and bronze finishes. Available in 38mm and 56mm diameters, the medal features an embossed design of chess board set behind a queen, knight and pawn. The High Relief Chess Medal has a small loop attachment at the top of the medal, to allow for easy assembly with your choice of clip on medal ribbon. 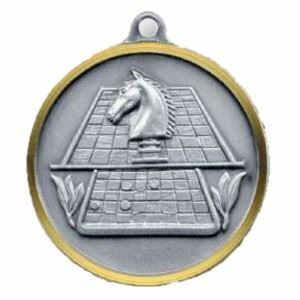 The High Relief Chess Board Medal is a bronze metal medal perfect for celebrating chess playing success. This stunning heavyweight medal has a loop at the top of the medal to ensure easy assembly with a huge selection of medal ribbons. As well as the embossed chess board design on the front of the medal, the back of the medal may also be personalised to your event with an optional printed text label. Made from bronze, giving a high quality, heavyweight finish, the High Relief Chess Piece Medal is a superior quality embossed medal featuring a chess board and pieces. The medal is available in gold silver and bronze coloured finishes and is decorated with a laurel branch frame. The chess medal has a small loop at the top to allow for the addition of a clip on medal ribbon, allowing you to add a touch of colour to the display of your High Relief Chess Piece Medal. Beautifully embossed chess pieces are featured on the Faceted Chess Medal. This superior quality, weightier medal is made from brass and has hand-faceted edges.